You don’t want to miss Caffeine and Chrome! 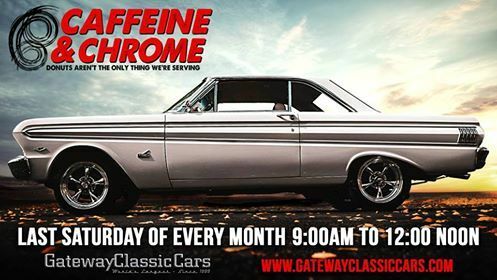 Join Gateway Classic Cars in one of our 17 showrooms for our monthly Caffeine and Chrome event. This occasion is open to the public and has NO admission fee. Cruise in with your collectible car or daily driver and bring your appetite. Indulge in donuts and coffee while supplies last. All makes, and models are welcome with plenty of parking space. Gather around with the car community on the last Saturday of every month for an experience you will not forget. Not to mention, we have a museum full of classic, exotic, and muscle cars. This is a family friendly event! Sound fun? Last Saturday of every month from 9 am till 12 pm. Now accepting vendors, please fill out the form below or call us at 618-589-9952. Gateway Classic Cars now has 17 Locations! All inventory is currently advertised with us ACC right now check out the location nearest you!